Co. Tyrone: Altaclady, Ballymagorry, Ballyneaner, Barron's Court, Church Lands, Douglas Burn, Dunnalong, Dunnamanagh, Caums, Glenmornan, Mountcastle, Newtown Stewart, Strabane (2), East Urney. Co. Donegal: Castle Finn, Cloghard, North Clonleigh, South Clonleigh, Feddyglass, Figgart, Raphoe, St Johnstown, Treantaghmucklagh, West Urney. The Board also included 5 ex-officio Guardians, making a total of 30. The Guardians met each week on Tuesday. The population falling within the Union at the 1831 census had been 62,084 with divisions ranging in size from Ballyneaner (population 1,656) to Strabane itself (5,556). 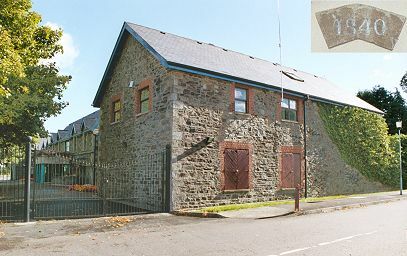 The new Strabane Union workhouse was originally planned to be built at Magirr in the Bridge Street area of the town, on land owned by the Marquis of Abercorn. The site was eventually rejected as unsuitable and the workhouse was erected in 1840-1 on a five-acre site to the north of Strabane, on the east side of the Londonderry Road. Designed by the Poor Law Commissioners' architect George Wilkinson, the building was based on one of his standard plans to accommodate 800 inmates. Its construction was carried out by Messrs Patterson and Catcheside at a cost of £6,885 plus £1,355 for fittings etc. The workhouse was declared fit for the reception of paupers on 18th November 1841 and admitted its first inmates on the same day. The buildings followed Wilkinson's typical layout. An entrance and administrative block at the west contained a porter's room and waiting room at the centre with the Guardians' board room on the first floor above. Extensions were later added at each side to provide children's accommodation and school rooms. Strabane entrance block from the south-west, 2003. The main accommodation block had the Master's quarters at the centre, with male and female wings to each side. At the rear, a range of single-storey utility rooms such as bakehouse and washhouse connected through to the infirmary and idiots' wards via a central spine containing the chapel and dining-hall. A burial ground was located to the north-east. During the Great Famine in 1845-9, a 70-bed fever hospital was erected at the south-east of the workhouse. A house was hired to accommodate an additional 36 inmates. Strabane fever hospital from the north-west, 2003. At the 1901 census, the population of the Union was 35,859 with 15 officers and 250 inmates in the workhouse. Much excitement was created in Strabane and district when it was learned early on Thursday morning that an attempt had been made to burn the Strabane workhouse, either late on Wednesday night or on Thursday morning. The building had been guarded by a force of the constabulary; but at the back, which is in the rural district, it appears that five or six men entered through a gate and made their way to the quarters of the matron (Miss O'Keefe). They were armed, and five of them were masked. They ordered the matron to leave the room, and marched her down one of the corridors in charge of a guard who was armed with a revolver, afterwards placing her in a room. The sixth man was neither masked nor disguised, but was unable to be identified. The entire building, which, it was supposed the military would occupy, was saturated with petrol and the place was strewn with empty tins. Those using the petrol would appear to have been inexperienced, as the heads of the tins were knocked off instead of the screws being used. Four empty tins were found afterwards. The petrol was carefully placed in all quarters especially about the stairs. The police were alarmed by the nurses, and on arrival they were unable to light even a match so great were the petrol fumes. Luckily, those who perpetrated the outrage forgot that in every corner of the building were fire extinguishers, and it was the expert use of these by the police that saved the premises. The woodwork on the stairs of all the rooms was covered with petrol and blankets hanging around the building were also saturated, as were the nurses' rooms, after the occupants had been evicted, particular attention being given to the various quarters which would have been occupied by the military. On Thursday evening the military arrived and took over the building. They were a detachment of the Dorsets, and this is their first arrival in Strabane. They were fully, equipped, including machine guns. Immediately before their arrival the patients in the District Hospital were removed in ambulances to Castlederg and Londonderry. In the 1930s, part of the dining hall block was used as a Mass House by Roman Catholics from the north side of Strabane. During the Second World War, the workhouse was used by the services as a NAAFI and for staff billets. The entrance block later became part of Strabane District Council Offices. The fever hospital became a district hospital in 1922 and was later Strabane Hospital. The main building and infirmary were demolished in around 1964. Public Record Office of Northern Ireland, 2 Titanic Boulevard, Titanic Quarter, Belfast BT3 9HQ. Holdings include Board of Guardians' minutes (1939-1948); Indoor registers (1862-1921); etc.